I’m going to show you how to get more out of the amazing content you publish online. Writing guest blogs takes a lot of time to research the topic, write engaging content, provide images, and pitch to quality websites. My SEO team and I utilize a few different methods to repurpose our content creation efforts by reposting our external publications on our own blog. Posting duplicate content on your website would normally be advised against, however, the strategies I’ll demonstrate in this article address the duplicate content issues and enhance your website’s user experience, RSS feeds, and email marketing. 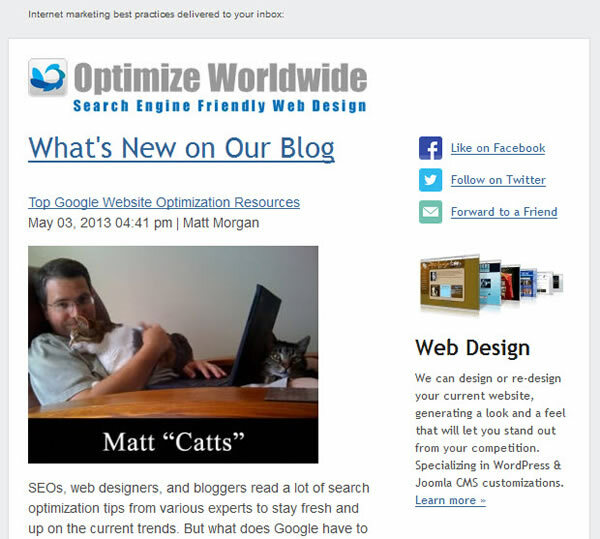 Let’s use an article I contributed to the Search Engine Watch blog a few weeks back, Top Google Website Optimization Resources, for this demonstration. By posting your external publications on your own website, you are allowing WordPress, or any other CMS, to display the thumbnail, an excerpt, and an article link on your website providing easy access to your amazing content. You spent a lot of time on your guest blog. This is a nice way to show your website visitors content you publish on other websites. 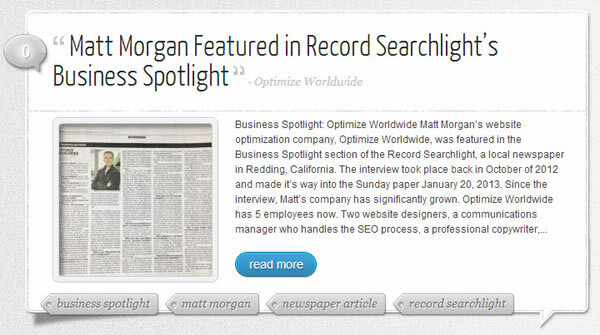 Notice on my search optimization blog that the SEWatch article is showing in my blog list. 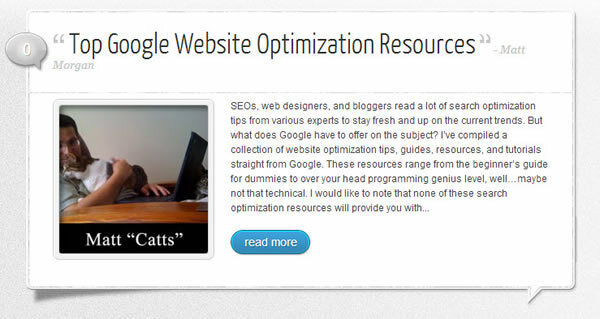 It also shows the article in my Recent Blog Posts list in the footer of my site. The excerpt might just show in the SERPs too. The screenshot below shows my main blog page with a snippet from a previous SEWatch article that I posted on my site using this method. 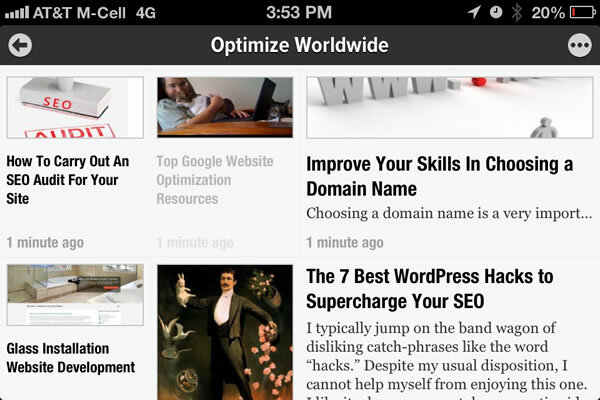 Take a look at an RSS reader app I have on my iPhone. 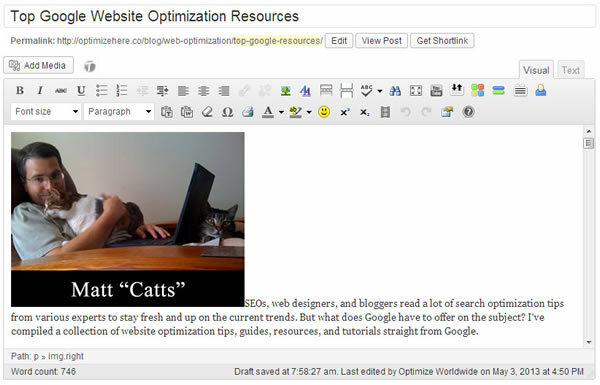 Notice the SEWatch article with Matt Cutts and his cats is showing when viewing my website’s RSS feed. Unless your followers were subscribed to every blog you publish on, they might never know about your content. We don’t do as much email marketing as we should, but I do manage to get out a monthly email to my blog subscribers using MailChimp’s RSS-to-Email feature. I created an email template, don’t laugh, and scheduled the campaign to check my blog for new content on the 1st of each month using my RSS feed. MailChimp conveniently compiles the email and fires it off. My blog subscribers get an opportunity to read the content I publish on other websites. Summarizing a publication is a great way to generate new content for your website while referencing the original publication. In the example below, I crafted a descriptive title, added an image of my news article, and summarized the interview from our local newspaper. The nice part about this method is you can provide an update. In this case, our company had almost tripled in size in just a few short months. If you have multiple sites that you own or control and publish content that is useful to the users of each individual site, then this method is preferred. By including an rel=canonical tag in the head section of your page that links to the original source, you can control which property Google displays in the search results and obtains PageRank. Search Engine Watch uses this method when republishing from sister publications like ClickZ, the Inquirer, etc. Dr. Peter Meyers, a marketing scientist at Moz, wrote up a really great article that answers a lot of rel=canonical questions. If you find yourself confused, I advise checking that out. If you are struggling to find time to summarize your publications and are worried about confusing the search engines with the rel=canonical tag method, you can simply repost your article and apply a 301 redirect. Some might argue that you are driving your website visitors away from your site, which you are. This might not be for everybody. I use this strategy for credibility. Our web and SEO company is pretty small, so I find it advantageous to show my potential clients that I’ve been published as an expert on popular SEO blogs or mentioned in the news. I’ve landed a few accounts and speaking opportunities from external publications. If you are a WordPress fan like me, first go out and install the Quick Page/Post Redirect Plugin developed by Don Fischer. Create a new blog post in your WordPress admin using the same exact content from your guest blog. Add your featured image, etc, etc just like a normal blog post. Now here is where the Quick Page/Post Redirect plugin comes in. Enter the URL of your guest blog post. And finally, publish your blog post. I’m not sure if this works as I’d hoped, but I was attempting to notify Google of new content that isn’t on my site using Google Webmaster Tools. Normally, you wouldn’t be able to fetch a page under a domain that you don’t have control over, but since I’m 301 redirecting my post, the fetch was successful and I was able to Submit to Index. Take a look at the screenshot below. I need to do some additional testing to verify that this works, but hey, it’s looking good! 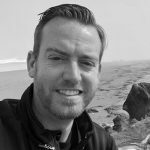 I tend to write more articles for other blogs than I do on my own website, so it’s a great way to show my clients and blog subscribers what I share. Seeing that this is an RSS driven tactic, I’d be curious to see if you have any other uses for this application. Share your comments below. You can read more strategies like this by following me on Twitter @MattMorgan105 or by adding me to your Circles on Google+.